Xayla is turning 3 March 1st. 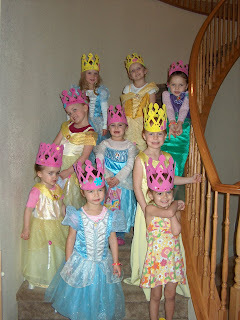 We had a lot going on that day, so we decided to have her princess party one week earlier. It was a lot of fun. We decorated crowns, painted the kids’ nails, did their hair, made bracelets, colored, etc. The party was really cute! All the girls had a good time and it was the perfect size party! Looks like Xayla and her friends had a great time. Xayla shares the same birthday as Jennifer’s new baby girl!